Aluminum foil tapes are used on seams and joints of fiberglass and aluminum backed duct board. Coated with a rubber based pressure sensitive adhesive, they provide an excellent barrier to vapor and conform to irregular surfaces. 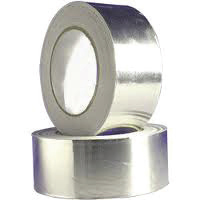 Aluminum foil tape may be used for shielding and covering thermal insulation.